The following article will attempt to explain just what a DDO (Design Development Overlay) is, and why DDO s are important to the development of a town. It is one of the standard planning overlays which are available for Council to use in it s Planning Scheme. The overlay enables Council to supplement the usual planning scheme zone controls with additional requirements relating to the future development of land. All land in the Planning Scheme is zoned for a particular use and may be subject to other overlays such as Environmental Overlays due to a stand of very rare trees, or a reserve for rare animals. There are Heritage Overlays which may signify an historical reserve, building or event. There are others as well e.g. Recreational etc. If you want to see where these are just go to a Shire Information Centre and ask or find them on the net on the DSE website. If you are looking for overlays you will also discover the many and varied ways in which land is zoned. Residential 1 Zone (R1Z) and Business 1 Zone (B1Z) are probably the most common. Others may include MUZ (Multi Use) and so on. Much of the country areas outside the townships and urban areas probably forms part of the older Rural Zones and may now be termed Green Wedge Zone 1 (GWAZ 1) and on it goes. GWAZ to MUZ it just comes down to another form of jargon that most different occupations use. What does a DDO do? The DDO has 2 Sections. The First Section includes all the standard things you would expect to see in a standard permit along with a list of decision guidelines that MUST BE taken into account in the assessment of any permit applications. The Second Section is termed .. The Schedule to the overlay and is written in a specific way to refer to specific things in the specific overlay area. It contains a statement of Design Objectives for the specified area with specific requirements that need to be considered in the assessment of any planning applications for future development. The specific requirements would include a range of design considerations such as building height, materials, colour, visual impact, setback from the building line and landscaping amongst as many as were felt necessary. In Mount Evelyn s case only 4 such specific areas or PRECINCTS have been decided upon by COUNCIL officers. These are Wray Crt/Station Street; Snowball Ave; Open Spaces/Warburton Trail and York Rd/Birmingham Rds. What can a DDO not do? A DDO cannot change the Zoning. It cannot change the land use controls that are set by the relevant zone. It therefore cannot prohibit any specific land uses. It is incorporated into the Planning Scheme but cannot change any other overlays that are already present. This is a Plate . All cakes are subject to the usual rules and permits under the Planning Scheme for C1Z as determined by Cake Scheme of 1995 for the usual permits and applications that can be made on this plate. But this cake is Subject To the Design & Development Order (DDO) of May 4th, 2006 as Approved by the Minister of Cooking subject to the following conditions. It must be no more than 150mm.in height. 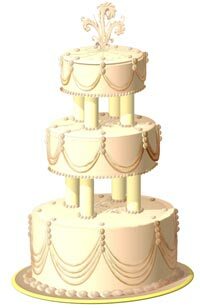 It must be a 2 tier Sponge cake and must remain beige in line with the acceptable Baking Law incorporated in 1788. Maximum size is 220 mm. in diameter. The Chocolate Icing must cover a minimum of 80% of its top. It s height must NOT block the view of the Embroidered Table Cloth in all directions. The cake must be set back at least 6 mm from the edge. 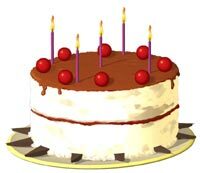 The cake can be used for birthdays where the noise is no more than 5 decibels. The candles must be no higher than 10% of the highest point of the cakes highest part. Reps from Shire, Developers, Traders, Community Groups and residents meet. Council members met with representatives from various Mt Evelyn sectors recently to relaunch the matter of Design and Development Overlays. The DDO s will cover the main Trade precincts of the town. Represetatives of Traders, Developers, MEEPPA, METIC, and residents talked with the Shire about concerns of ad-hoc planning and development. Concern over the wishes of Mt Evelyn people being shelved in the future was raised. The fact that the Township Plan that was worked on by so many people ended up sitting at the Shire for around 5 years gathering dust is an example of what we want to avoid happening again. The Shire has set an unsought early deadline on submissions. Matters that the reps want included in the DDO have been sent to the Shire, and should be on exhibition early April. The DDO is planned to be raised at the Council meeting on April 11. Shire Councillors and council staff have now assured Mt Evelyn residents that a complete review of the retail precinct, including comprehensive community consultation will be undertaken. This process should result in an update to the existing design and development overlays and remove inconsistencies that allow for inappropriate developments to be undertaken. We understand that this process will begin shortly and is likely to include consultation with a small reference group representing Mt Evelyn traders, township committee, land owners, environment groups, residents and community. Existing documents produced in partnership with council and the community, including the Mt Evelyn Urban Design Framework, Mt Evelyn Retailers Business Plan and the Village Well project will be used as a base for developing this review. A draft proposal will be developed and presented to council in the new year and if accepted will be exhibited for further comment prior to final incorporation into the planning scheme sometime around mid-2006. This should be a great outcome for the community, the retailers and the landowners as it will give clear guidelines and certainty for future development and growth in the Mt Evelyn shopping centre. It should provide adequate protection for local residents while still allowing sympathetic commercial and retail development to take place. The general feeling in Mt Evelyn is that this is a win-win for all parties. 1. 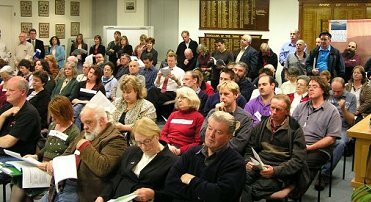 That Council, having regard to the submissions made in respect to the Amendment C14, and its effect on the future development of land at No 3 Snowball Avenue and 18 Station Street Mt Evelyn, resolve to initiate an investigation into the application of a Design and Development Overlay (DDO) to the whole of the Mt Evelyn Activity Centre. 2. That the DDO respond to the urban design and built environment issues and outcomes raised in the Mt Evelyn Township Plan-Urban Design Framework, which was prepared by the Mt Evelyn Township Improvement Group (METIG). 3. Further, that the outcome of the investigation, including any draft DDO and planning scheme amendment and any comments from the Department of Sustainability 8 Environment, be reported back to Council before the amendment is exhibited. The Shire of Yarra Ranges council met on Sept 27 to discuss the issue of the rezoning of the land on the corner of Station St and Snowball Ave, Mt Evelyn. Approximately 60 concerned residents turned up to fill the gallery and hear any resolution. The issue attracted the usual local press coverage, and also a cameraman from Channel 9. 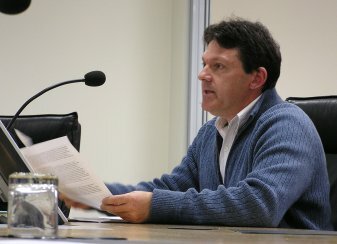 Mr Colin Gillam spoke to the councillors about the flawed communication process that allowed objectors to the original rezoning to withdraw their objections based on the understanding that the land in question was going to be used for a medical centre, but didn't allow objections when the proposed use of the land was changed after the objections were withdrawn. The council responded with a resolution that a Design and Development Overlay for the whole of the Mt Evelyn central business district be investigated. The points brought up by Mr Gillam, who was speaking on behalf of many Mt Evelyn residents, were not addressed by the councillors. Mr Gillam said afterwards, "While on the face of it, this looks like a poor compromise, I believe that the Council has come up with this alternate proposal to buy them and us time to look at all the issues again." Cr Len Cox said he was dissappointed that the proposal didn't get to the objectors before the meeting, so no-one had time to study its implications. The resolution was passed. Both Cr Smith and Cr Larkman withdrew due to conflict of interest.